It is the policy of Hospitality House that service animals assisting individuals with disabilities are generally permitted at Utah’s Place and vehicles used to transport guests except as described below. The Americans with Disability Act (ADA) defines a service animal as any guide dog, signal dog, or other animal individually trained to provide assistance to an individual with a disability. If they meet this definition, animals are considered service animals under the ADA regardless of whether they have been licensed or certified by a state or local government. A service animal may be asked to leave Utah’s Place and vehicles used to transport guests, if the animal’s behavior or presence poses a direct threat to the health or safety of others. For example, a service animal that displays vicious behaviors towards people may be excluded. Service Animals may also be excluded in areas where the presence of a service animal fundamentally alters the nature of a program or activity or is disruptive. Examples may include, but are not limited to, food preparation areas (that does not include dining room areas) vehicles used to transport guests. In addition, animals not covered under the ADA service animal definition can be asked to leave Utah’s Place and vehicles used to transport guests. Questions related to the use of service animals should be directed to Executive Director at 530-271-7144. Rules for Service Dogs while at Utah’s Place and vehicles used to transport guests. 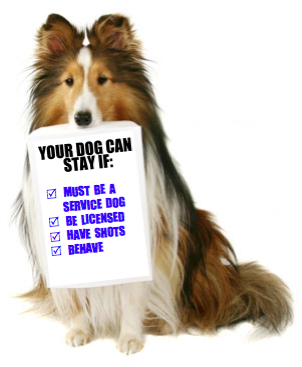 Service animals must be immunized against diseases common to that type of animal. All vaccinations must be current. Dogs must wear a rabies vaccination. The owner shall keep his dog or other domesticated animals under restraint at all times and shall not permit such dog or other domesticated animals to be at large off the premises or at any time while participating in the Hospitality House program unless under the control of a competent person. Under Control: The owner/keeper of the service animal must be in full control of the animal at all times. The care and supervision of a service animal is solely the responsibility of owner/keeper. Cleanup Rule: The owner/keeper of a service animal must adhere to city ordinances regarding the cleaning up after the animal defecates.